Gwyneth Herbert has just opened the fan-funding for her new album project on the Indiegogo platform. 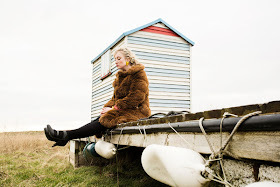 She will be launching the new album of 'sea-set story-songs' in May. The songs were written on an artist residency at Snape Maltings in Suffolk, where the album was recorded last summer. There are various levels of support ranging from 'Pirate' at fifteen quid, up to 'Admiral of the Fleet' at £1500, with rewards in proportion to the money spent. The money is being raised to cover the fees of ten musicians, mixing and mastering, photography and design of the album and PR. MORE DETAIL HERE. It's sad to see a musician go from being on a major label to asking the public to fund her album up front. Why is it sad? To me it's empowering. It means to me that the artist is finding a way of establishing herself as a business with the help of people who will genuinely care for her music and seeing her develop and move forward as opposed to a label which will only show interest in the artist if it seems it will be financially profitable to them. Crowd funding is certainly the future. Think of it more as an investment in culture and society. It gives much more control to the music and the artist. For someone like Gwyneth not to be on a major now is mainly the fault of the changing nature of the 'majors'. As shown by the number of quality innovative releases on majors nowadays. I think Gwyneth's move from the major deal she had was a testament to her integrity and proof that she is a true artist not industry puppet. We have to change our mind set: there's no shame in fan funding and not being on a major is no failure. Gwyneth along with many others is making (another) empowering and honest statement and I wish her every success. I should have elaborated more. To Georgia-- I hear what you are saying; for me there is no problem with being on or not on a major label. I don't believe being on a major label means someone is a puppet. Look at Robert Glasper (Blue Note) he was given full control and budget on his last album and now he's a grammy winner. To Babel- "Quality Innovative" releases? Do we see truly 'innovative' releases anywhere nowadays-- forget about Majors? That word gets thrown around too much. And to anonymous-- I invest in culture and society daily (either by choice or by paying taxes) so that's a throw away statement. My problem is the concept of crowd funding. We are continually given vague figures by artists who want us to fund their album up front, and in Gwyneth's case we are told "We need at least £10,000 to set sail." It seems she isn't even sure how much it will cost. I think personally the costs should be explicitly listed so we know exactly what the money is going for. What if the album has already been paid for? How do we know it hasn't? How do we know this album won't get funded and then sold to a record label after the fact? Doesn't that seem a bit unethical to ask fans to do something like that? At least when I buy a record (and I have thousands) I know that the artist or label has been able to get the record out on their own two feet. Now we live in a time where artists seem to not be able to afford to put records out and my initial impulse is perhaps for them to save up until they can? Perhaps one shouldn't be releasing such grandiose projects unless they can fund it themselves? And what does having the public fund the album up front teach the artist? Since they haven't paid for anything do they actually go out and push the record to try and make sales back? Seems to me that if an artists paid for the record themselves they would have much more incentive to actually push that record with live concerts and sales in order to make that money back. I'm not taking anything away from Gwyneth (I have all her albums) it's just that this crowd funding thing really rubs me the wrong way. Another crowd funding plea on this site happened recently was the Reuben Fowler big band article. Here this artist has already been given 3 public grants towards the project, he is going to release the album on Editions records (a record label!) and he is still asking the public for money! What is the record label paying for (and this record label is being likened to ECM)? So after we fund this project up front, the record label is going to then try and sell it to make profit? Is this what record labels are going to start doing now? Is this really what releasing creative music has come to? What happened to getting a loan and paying that back? Many small businesses have to get a start up loan in order to get their projects off the ground. I am an avid supporter of the arts year round, but this recent surge of asking the public to fund albums with arbitrary figures just doesn't sit right with me, perhaps there are better explanations or models. There are two many variables that the public is not told about during the funding process. When artists apply for grants for up-front publicly funded money they have to give detailed accounts of where the money is going, they are then chosen by a supposed expert panel who have been entrusted by these bodies to deem the project worthy of this public money. Proof is then needed during assessment to ensure the money has been allocated correctly. Perhaps I'm just old fashioned in thinking people should stand on their own feet. These comments are very strange...Tim C, since when a musician leaving a major is sad? To me it is quite an understandable move, as Babel blog wrote it gives you more control as an artist (although it is not always a good thing). Also major companies have a tendency to forget about their back catalogue unless you're Miles Davis. If you produce your album by yourself, you keep the tapes. I also think Georgia is going a bit far by describing artists on contract with a major company as "industry puppet". The discourse that automatically makes major companies baddies exploiting the poor artist is too simplistic and really annoying. If I follow you, Wayne Shorter who's been with Verve for years and now is back with Blue Note lacks integrity? But to come back to Gwyneth Herbert her last album produced by a major, Universal, was "Bittersweet and Blue" in 2004!! 9 years ago. "Between Me and the Wardrobe" was picked-up by Blue Note after it has been released on Gwyneth own label, so that doesn't count. Since then she's been on Naim Edge, hardly a major label. Obviously, she's been off major deals for a while. Finally, although crowd-funding (another word for subscription-based) is now getting momentum, jazz artists have been using that system for a long time. For example Maria Schneider used Artist Share since 2004 and Jim Hall since 2005. Dave Douglas use subscription too. Since Gwyneth first appeared at Picnic Jazz at The Pavilion in Orford in 2005 she has demonstrated that she is an immensely talented wordsmith and performer. The only performer to have been invited back she captivated the audience in 2010 and is obviously stretching her wings to fly in whatever direction she chooses without the restrictions of being tied to a big label. A sneak preview of the album confirms that she continues to evolve and not limit herself to following others. Hey folks, good to see that this has encouraged some lively debate and thanks for some lovely comments. I note here the expression of a desire for an artist to "stand on their own two feet" - that is precisely what crowdfunding is enabling me to do. Even though patronage has been at the heart of making art possible since before Mozart's time, I am cursed with that very British reticence of asking for money. But here, I am not asking for charitable donations. If you read my campaign information, you will see that every different contributory package has its own reward, be it a signed album, a singing lesson, a bespoke song written and recorded and pressed onto vinyl, or even a concert in your living room. In a way, it kind of is like the "getting a loan and paying it back" option that has been championed in this discussion, although the "payback" isn't interest to line the bank's pockets but rather individual creative bespoke experiences which take time and work and joy for me to create, and rather than building a relationship with my bank manager, I'm developing a relationship with my fans, which is something that is very important to me. I acknowledge that for some artists, the major label option is still preferable - even though the era of big advances is well and truly over, they have great infrastructure both nationally and internationally to help to reach large audiences, and established artists especially are not always asked to compromise their creative vision. It wasn't the right option for me, and since leaving Universal 8 years ago, I have had more stimulating, stretching and rewarding experiences and collaborations than I ever dreamed possible. It's hard work and I love it. Still, with ever-decreasing CD and digital album sales, struggling venues and huge funding cuts, it's getting even more difficult to make a living from being an artist. For people like me, we need to think of imaginative ways to continue to "stand on our own feet", to make the art that we want to make, to form a dialogue with the people we want to hear our stories. How wonderful that listeners and creators might not need to rely on banks and big labels to make and hear stuff, but instead we can form a community of creators and appreciators alike. And, just as I am proud and excited about my hopefully "innovative" album and my upcoming tours throughout the Summer and Autumn, I am looking forward to every commissioned song I write, every living room I visit, every singing lesson I give, and every individual album I sign and pop in the post. I'm quite keen to take part in this but as it's a flexible funding campaign then funds will be still contributed even if the goal isn't reached. This means there might be no album to give at the end. What will actually happen if the goal isn't reached ? Gwyneth makes several good points; due to the drastically changed face of the record industry it's vital that if an artist wishes to continue putting work out there they must adapt and evolve - the way I see it these crowdfunding initiatives are a great way to secure capital for ambitious projects, and the personalised rewards contributors receive are a great incentive - from what I've seen, people supporting something they love / are passionate about like to be involved in the process somewhere. In response to your rant about the Reuben Fowler project and the question of what the label puts in, the answer is - very little. Both Fowler and the previous Kenny Wheeler prize winner had to dig deep and essentially self-finance their records, and Reuben's is a particularly ambitious project. Whether or not that's right isn't for me to decide, and I would venture to suggest it's not for you, either. Who's comparing Edition to ECM? I think it's important that these new records get made, that new music can be made that's sole purpose isn't to make or recoup money - whatever your opinion is on Glasper (I find it crushingly dull), I think it's pretty clear Blue Note expected that one to be a success; if you don't agree, you don't have to play the game, but my support is fully with artists like Gwyneth and Reuben, and I genuinely hope to see more ways emerging of good new music being made! As a fan, I found it exciting to be able to contribute to an album of an artist I enjoy. I have little to no muscial talent but I've money in the bank and a desire to spend it on something I actually want. Being able to contibute to Gwyneth's album is like being a tiny part of the process. And it's made me a whole lot more than a tiny bit happy. Win-win situation as far as I can see. That's a very good point to raise, Anonymous at 19.13. There is much debate about the notion of flexible funding. Many crowd-sourcing platforms don't do it at all, as they feel that the quality of the product may be compromised or the project itself won't be able to reach fruition. Being a newbie to this way of working, I thought long and hard about which option to go with for The Sea Cabinet. I really had no idea how what the response would be... as it is, I've been utterly staggered by the financial generosity and general support so far, even in such an early stage in the process. In this particular case, as I mention on the indiegogo site, the album has already been made over the summer of last year, and I'm so pleased with it. The recording studio was generously donated by Snape Maltings, and my super-lovely musicians, artists, photographers and producers have been giving their time, musicianship and studio spaces for partially deferred payment, which will be brought up to their full rate by the money raised. They're all world-class professionals who have faith in the project and I am indebted to them. The imperative immediate cost of manufacture - printing and pressing with a 6-page sustainable card eco-friendly digipack- is £1,656 inc VAT, which has already been covered by the amount raised, so all albums promised so far can be made and delivered. Since we have raised an amazing £2,390 over the last week and a bit, I'm really hopeful we'll reach our target within the next 50 days. If we didn't for any reason then we'd have to rethink how to recompense the amazing creative people involved for their valuable time and expertise. I am excited about this album and really want it to be heard, so part of the target includes money for PR to help spread the word... I'd have to somehow find another way of raising these funds further down the line. Please be reassured every promise, be it a CD, t-shirt, bespoke song or gig, will be honoured. Hope this helps. Gwyneth, thanks for clearing that up. I guess the circumstances of each project can be different as in some cases the album is yet to be recorded at all. Hopefully your explanation might help to swell support even more from readers of this blog. I think these crowd-sourcing ways of funding are are good fun to get involved with and bring the fan and supporter much closer to the music. Yours would be the 4th such project that I'd supported. Just to clear up one of the comments made by Tim C above regarding Reuben Fowlers project which will appear later this year on Edition Records - This release (like most on edition Records) is called a 'Licensing Deal', which means that Edition take from Reuben a finished master Cd - in other words Edition is not involved in the recording of the project - this means the artist (Reuben) has total control over the musical content of his Cd - Edition then undertake to present this product to the market by completing the CD artwork design, distribution, marketing and the accounting process (making him payments when he sells Cd's) - leaving Reuben free to concentrate on what he is good at - playing and writing music. I think this is a wonderful way forward, so that those who support you and love your music can continue to hear you and buy your work! I have been investigating the ins and outs of crowd funding for a few months and will probably be going this route with my current project later this year. It seems a logical and practical way forward and gives the artist more control... and as you say, it's an opportunity to connect more directly with your fans and listeners. Best of luck Gwyn and lots of love! I might be wrong, but it is my understanding that if all the money isn't made then your contribution isn't collected. It's kind of held off until all the money is made. I contributed to a photography book and the money was used. I contributed to a biography/and film and the money was not, because they didn't make their target. So whoever was worried about that ... fear not! Meanwhile, it is great, Gwyneth, that you chose to leave a major label to follow your own muse. I saw you in New York and you were an extraordinary performer and musician. And absolutely unique. I loved what you did and so did everyone else there. If the record label you were on didn't want you to do your thing ... maybe the world would have had a few more jazz standards albums in it (perhaps this is an emergency I am not aware of...), we'd have missed out on your beautiful authentic-self music, and you would have had to take up drinking or something. Tessa, there is a distinction between flexible funding and fixed funding which means in this case that the contribution is collected even if the target hasn't been reached. This was my initial concern but from what's been raised so far the costs of the manufacture of the CD are already covered. Since I posted a fair amount more has also been raised.